Back at Muk Tuk. Finally the Germans have flown out. 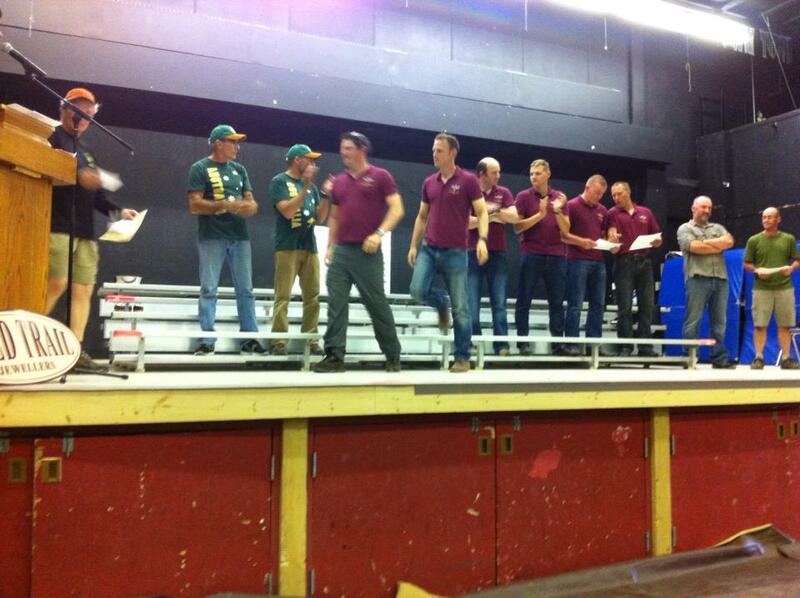 But all good fun. Canada Day today so nearly everything is shut. Raining now and strong Southerly wind just what we wanted across Lake Labarge, but that did not happen. Urs and I pulled up well, poor Steve Mooney still having trouble sitting down. Big prize ceremony about six hundred people. If you email Harry Kern, haywire@polarcom.com , he will send a lot more pictures back. Spoke to Igor at Dawson he has given up photography, now does joinery. He did not look well. no front teeth and very thin. He did not know I was in the race. He sent his regards. Give my Love to Lissa before she goes. I fly out day after tomorrow, ie Wednesday the third, in the morning. It is now Monday three in the afternoon. 11 a.m. – 3 p.m. Awards banquet at Robert Service School (NEW LOCATION), 3rd & Queen. Banquet tickets added to racer packets. Extras may be purchased from YRMPA at registration. Catered by Percy De Wolfe Society and Northland Beverages. On Arni's lap top in a dining room some where in Dawson. Good nights sleep, blisters recovered, shoulders sort of recovered, arms sort of recovered, bum sort of recovered, we will try to find Diana's massage chair. There is a shop in Dawson that sells all sorts of stuff. The idea is the men sit in the massage chair while the women shop. We knew the double canoes were faster through the water than us, so we tried all sorts of short cuts to catch number 19 ahead and stay ahead of the canoe behind us. Some short cuts payed off others did not. Off course we can only see about 2 kilometres on the river and then they are only dots. We often caught up to the dots only to find out they were big logs. We did see the second canoe ahead but thought it might have been the first. Once we were on the straight track to the finish they just powered away out of sight. Great boat, great company, great land crew. 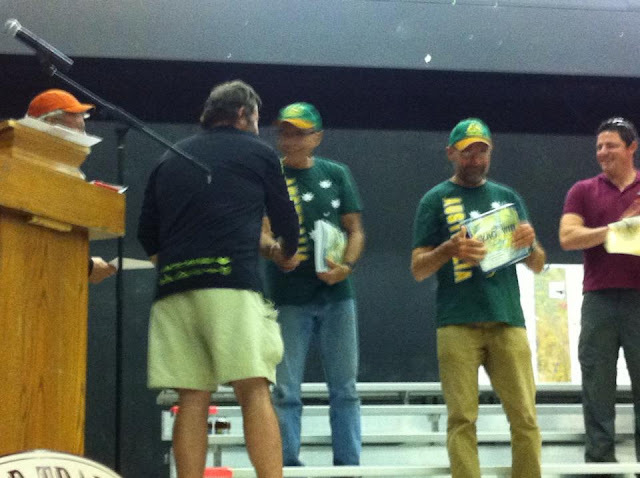 We are stoked we won the double kayak division by some hours, we will give you the margin when we find out. Thanks for all the face book support, and others, it realy spured us on and made us forget the pain. 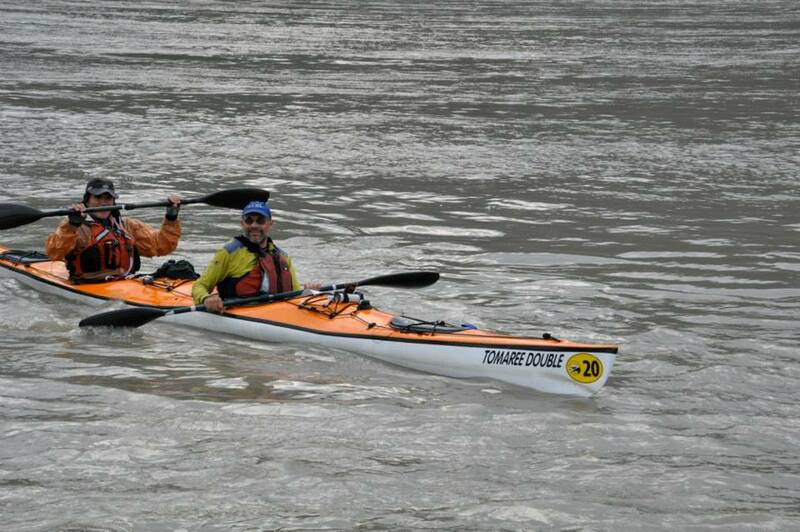 Urs and Tom have finished 3rd after 2 double canoes. 1st boat "Round Side Down"
2nd- "Looking for Forty Creek"
Aims To experience this amazing event a second time. Aims Leave nothing on the river. Reason for Entering Still addicted. Urs and Tom - "Team On the Way to Maine"
are 4 hours from the finish in Dawson in 2nd place, 20 minutes behind the leaders - "Round Side Down". There is another double canoe - "Looking for Forty Creek" 7 minutes behind. 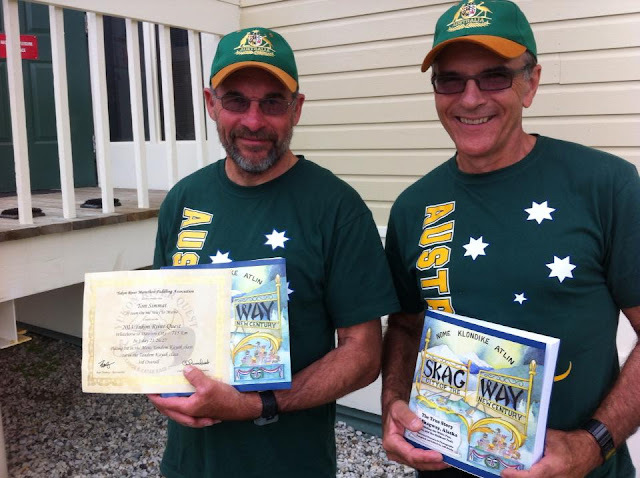 Over 700 kilometres of paddling for over 40 hours. 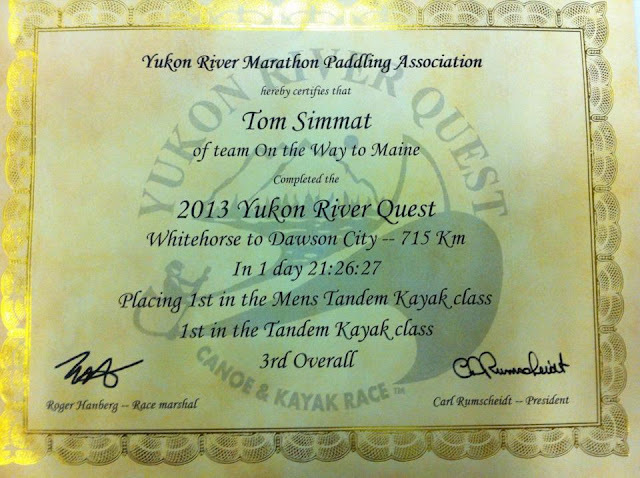 CARMACKS – Two tandem paddling teams continue to battle stroke-for-stroke in the early going of the Yukon River Quest. 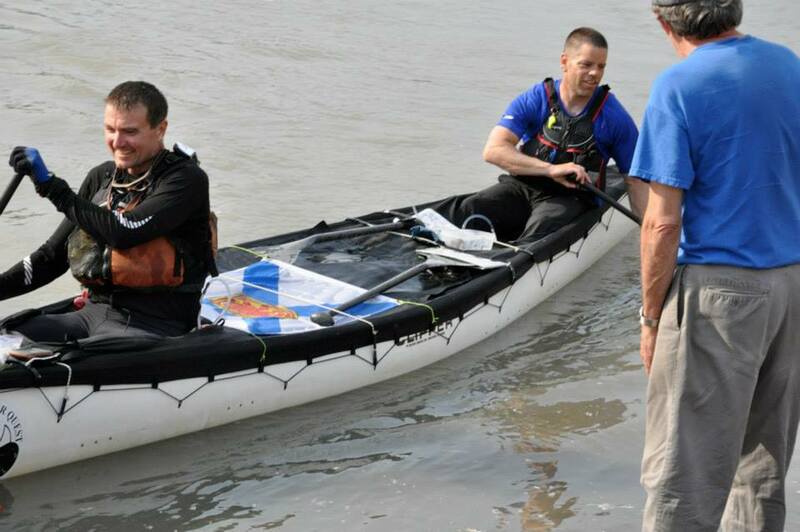 The canoe duo holds a seven-minute advantage over the kayak at Carmacks, the first mandatory layover along the race route. Menʼs tandem canoe Team 19 ʻRound Side Downʼ pulled into the Coal Mine Campground just before 8 a.m. this morning. Paddler Tim Lynch of Faro and Dave Lewis of Nova Scotia held their early lead over Australians Tom Simmat and Urs Mader of Team 20ʼs ʻOn the Way to Maineʼ after passing them on the river after Lake Laberge. Menʼs tandem canoe team No. 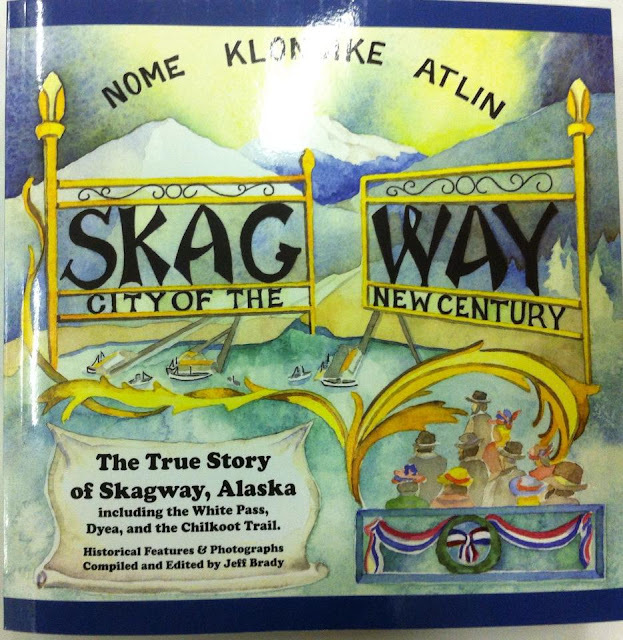 32 ʻMen of the Midnight Sunʼ was third, arriving at 8:20 a.m. The Yukoner admitted it will be touch to shake the Aussie duo that remained hot on their heels. ʻOn the Way to Maineʼ lead paddler Tom Simmat said they werenʼt able to keep pace with the leaders in the fast water past the lake. The two had exchanged leads a few times before the canoe team took the lead for good about two hours before reaching Carmacks. “We expected to be in the first two,” Simmat chuckled. A large contingent of volunteers and fans was on hand to welcome the leaders in, after the campground was awakened at 5:15 a.m. by a group of angry crows. Whoops and cheers went up from the crowd lining the Yukon River each time a canoe or kayak was spotted on the horizon. Checkpoint in sight, many paddlers appeared reenergized, paddling strong to the small dock where they were greeted by race volunteers. Many struggled with sea legs while climbing out of their boats, having spent more than 20 straight hours paddling from Whitehorse. Inuvik paddler Kendall McDonald, from the third-place team, said he was looking forward to a shower, for starters. He and teammate Tim Gordon entered Carmacks about an hour faster than their time last year. 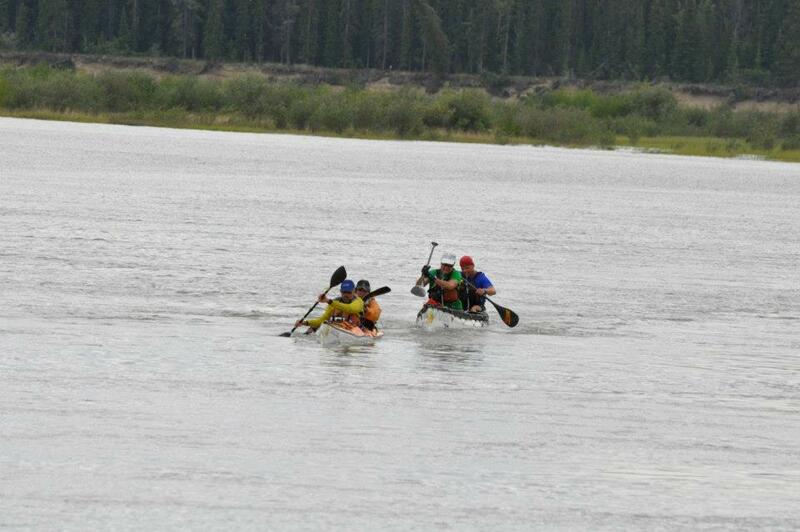 Paddlers experienced some good luck while crossing the long, and historically perilous, Lake Laberge. Smooth waters and sunny skies had racers in good spirits early. Shouts of “Living the dream!” came from a voyageur canoe paddling past the media boat. “How far to Dawson?” queried another. 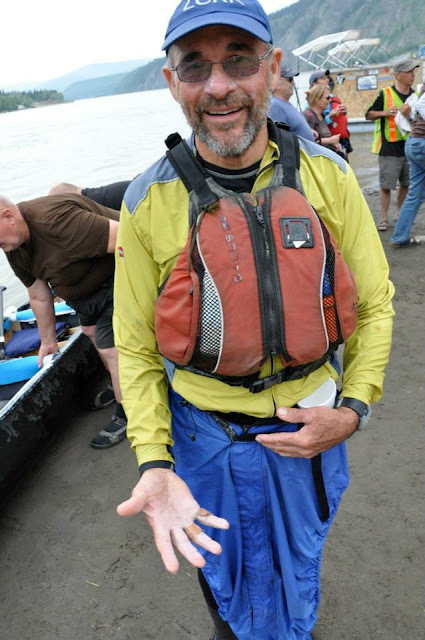 One of the paddlers near the back of the pack even offered $15 for a cold Yukon Gold lager – a request the media boat could not fulfill. 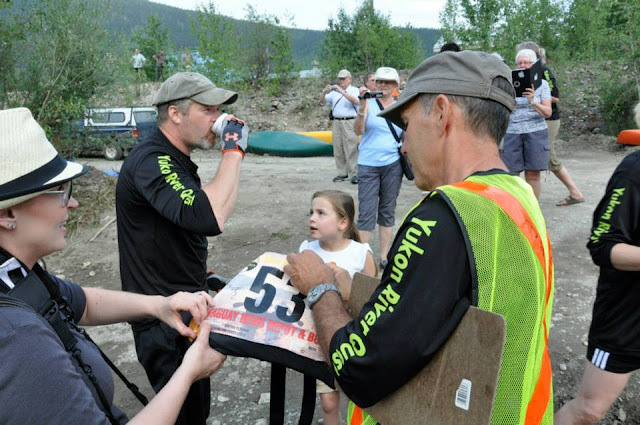 Conversations around the checkpoint dealt with the quick tandem canoe and kayak times during the first half of the race. Typically, the race is led by the eight- or 10-manpower voyageur canoes, but not so this year. The first four teams into Carmacks were tandem teams. “The whole scope has changed this year,” said longtime race media coordinator Jeff Brady. “It used to be voyageurs, voyageurs, voyageurs.